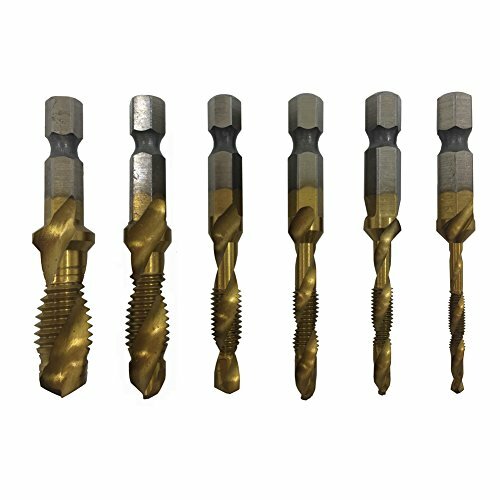 Specifications Item Type: Step Drill Size: #1: 3/16" to 1/2" 6 Steps (3/16'', 1/4'', 5/16", 3/8'', 7/16'', 1/2'') #2: 1/8" to 1/2" 13 Steps (1/8", 5/32", 3/16'', 7/32", 1/4'', 9/32", 5/16", 11/32", 3/8'', 13/32", 7/16'', 15/32", 1/2'') #3: 1/4" to 3/4'' 9 Steps (1/4'', 5/16", 3/8", 7/16", 1/2", 9/16", 5/8", 11/16", 3/4") #4: 1/4" to 1-3/8" 10 Steps (1/4'', 3/8", 1/2", 5/8", 3/4", 7/8", 1", 1-1/8", 1-1/4", 1-3/8") #5: 3/16" to 7/8" 12 Steps (1/4'', 5/16", 3/8", 7/16", 1/2", 9/16", 5/8", 11/16", 3/4", 13/16", 7/8")" Features 1. Cobalt added reduces friction and lasts longer than those which does not contain cobalt bits. 2. 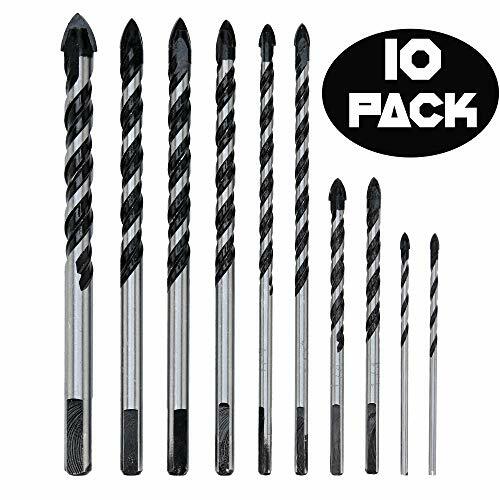 High speed steel for longer service life. 3. Double cutting blades design enables a faster and smoother cutting. 4. Automatically deburrs holes while drilling 5. 3-sided shank prevents slip in drill chuck 6. Includes a protective aluminum case to make the drills not easy to dull. 7. 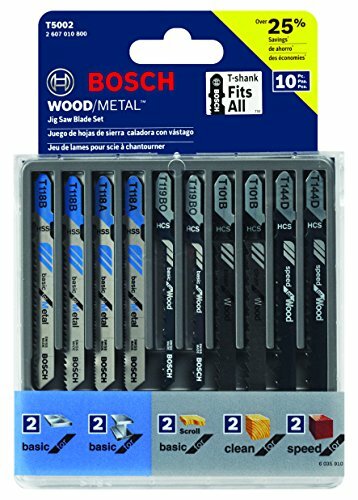 The sharpness and titanium coating ensure easily cut through most sheet metal, plastic and of course wood and some other materials with ease. 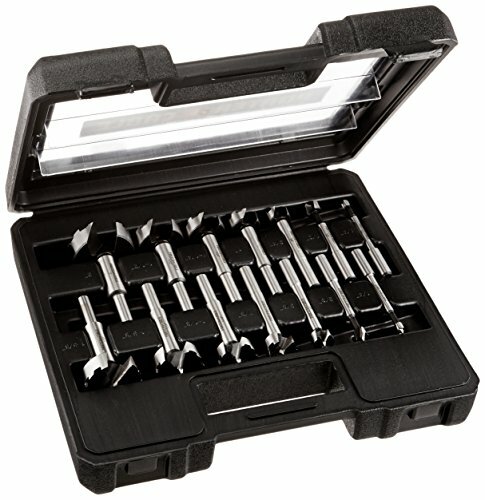 Package 5x Step Drill Bit Set 1x Aluminum Case. Features. 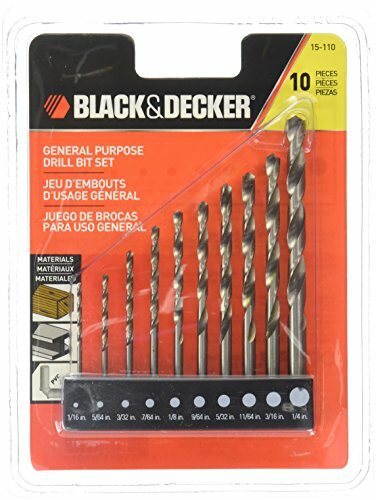 For most DIY projects.. For drilling in wood metal or plastic.. Includes bit bar.. Dimension - 4.88 x .75 x 6.5 in.. Item Weight - .25 lbs. 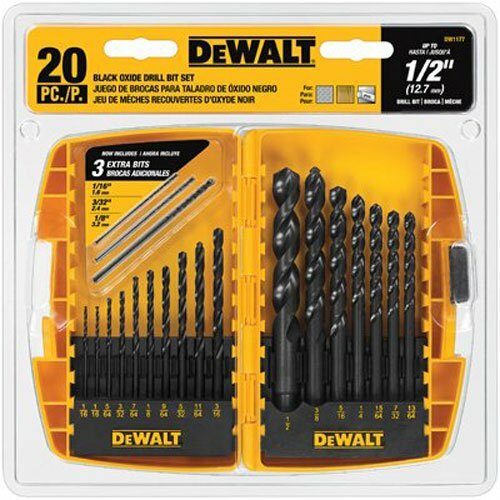 This 10-Piece drill bit set contains the most popular range of drill bits - sizes 1/16-Inch to 1/4-Inch. It is organized by a handy bit bar that makes storing this set in any toolbox, pocket or kitchen drawer easy and organized. Werkzeug Direct Only Please purchase products from store Werkzeug ONLY, other sellers are all without authorization. 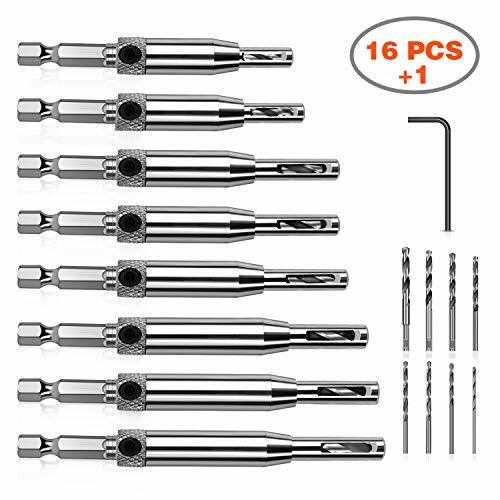 Werkzeug would not responsible for any other counterfeit sources.The countersink drill bit is made of high carbon steel material with titanium nitrate coating. High hardness, durable and offer superior cutting power. Unique Design Three-Pointed design can quickly and accurately drill a smooth hole. Five-edged chamfer design will fast discharge chips from the hole on both sides automatically. User-friendly Design Use the hex key to remove five-bevel chamfer or adjust counter sleeve depth and drilling depth for screws of various lengths. 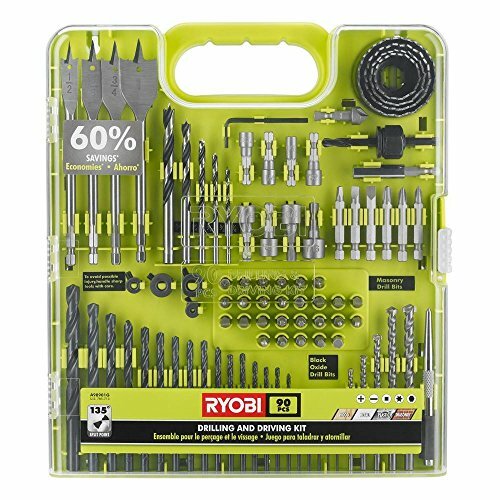 Extremely Versatile - The Countersink Drill Bit Set is includes 1 piece of hex key and 7 pieces of countersink drill bit in 7 different sizes to satisfy all you demand. Multipurpose Perfect for Granite, tile, glass, quartize, ceramic, vitrified brick etc. Suitable for bench drill, hand drill and conventional electric drill. Quickly repairs damaged bolts and tightens the nuts in place;simplifies the repair process, eliminates the need to replace expensive or hard-to-find hardware. Simple operation, using the lowest speed on the drill bit, and then slightly applying pressure to remove the burr;convenient to use, save more than 80% time. This deburring tool bit works by a way of shearing metal layer by layer;safety conscientious design means no cut hands, no sparks, and no burns. This deburring chamfer tool is made of CR12MOV steel, high strength and hardness. Includes 1/4 in. Forstner Bit, 3/8 in. 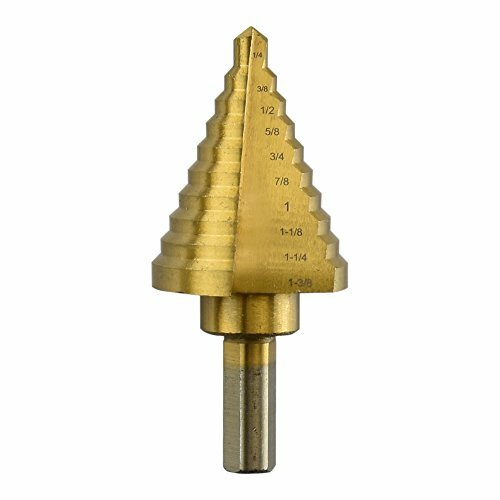 Forstner Bit, 1/2 in. Forstner Bit, 5/8 in. Forstner Bit, 3/4 in. Forstner Bit, 7/8 in. Forstner Bit, 1 in. Forstner Bit, 1-1/8 in. Forstner Bit, 1-1/4 in. Forstner Bit, 1-3/8 in. Forstner Bit, 1-1/2 in. Forstner Bit, 1-5/8 in. Forstner Bit, 2 in. 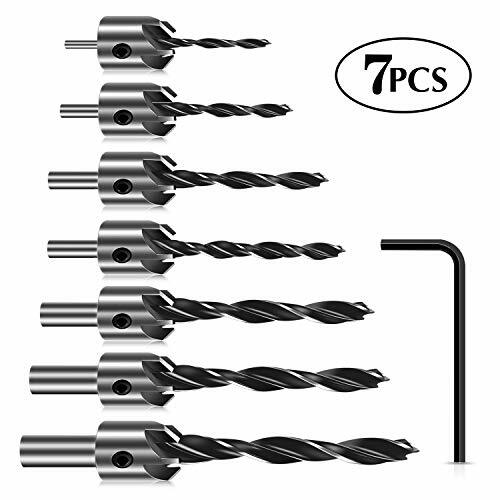 In one step, you can drill, countersink and counterbore the perfect sized hole for #4, #6, #8, #10, or #12 screws. Counterbores are 3/8" or 1/2" diameter. Ideal for plugs or dowel buttons. 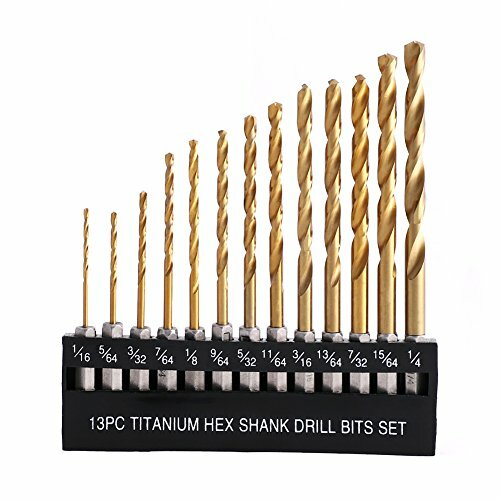 The 1/4" hex shank can be used with power drills and quick change chucks.
. Drilling and tapping in one, one-step processing, greatly save processing steps and time costs, improve working efficiency.
. Package Included:6pcs Drill Tap Countersink Set.
. 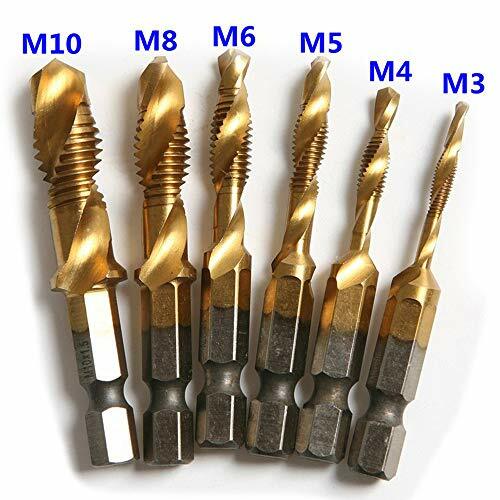 Metric Thread Size:#1 M10 1.5,2# M8 1.25,#3 M6 1,#4 M5 0.8,#5 M4 0.7,#6 M3 0.5.
. Shank Dia:6.35mm 1/4 Hex Shank.
. Suitable for drilling, tapping, cutting on soft metal, aluminum plate, iron, etc. These accessories should be used with a drill with a 3/8" chuck. 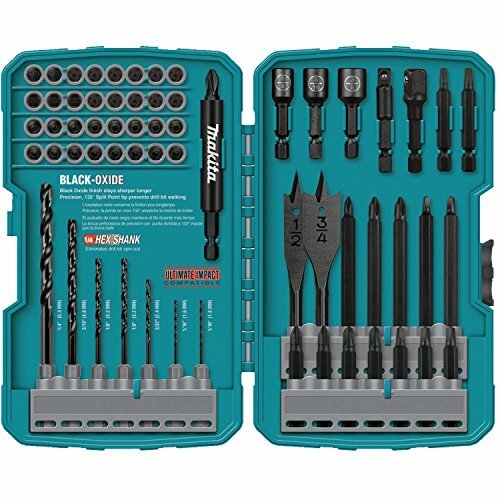 The Makita T-01725 70-Piece Impact Drill-Driver Bit Set offers a full range of solutions for drilling, driving and fastening. Each bit is black-oxide coated to resist corrosion, with a proprietary heat treatment engineered for longer bit life. Manufactured with Ultra-Lok 1/4-inch hex shanks, the T-01725 is a perfect companion for a driver-drill or impact driver. - Weight: 0.9 lbs Why choose our product? Have a machine milled point and blade flighting that starts immediately above it. As soon as they hit the ground, they start digging. Have an extended bead weld at the top and bottom which will not break easily. 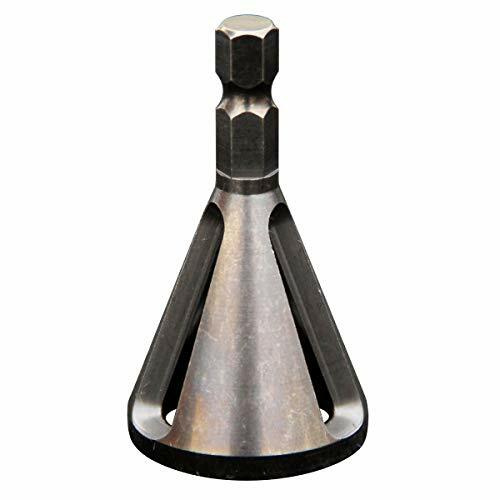 Have a machined Hex Shaped end giving excellent balanced grip in drill chucks. 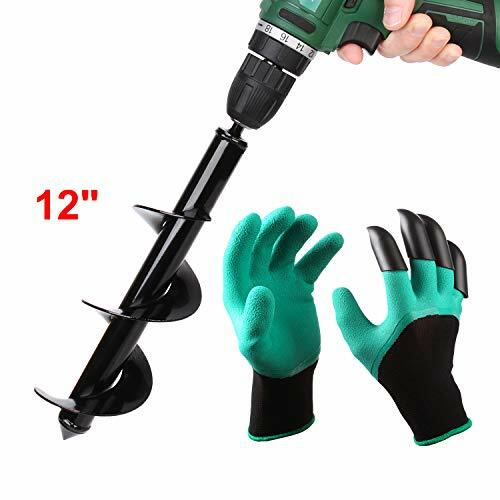 It eliminates constantly bending over while drilling, and this rapid planter will drill through loose, even rocky materials, so you can plant bulbs and bedding plants anywhere you want. Will work for Drills of all sizes. 18V or greater drill recommended. Plant hundreds or just a few bulbs in minutes. Material: Made of high speed steel, with glossy black painted finish. Size Information: 63/64 inch (2.5cm) steel shaft with non-slip hex drive (0.8cm); 3-inch (7.6cm) diameter x 12-inch (30.5cm) length. Hex shaft Non-Slip design that fits any electric or cordless drill. Easy to use: It uses your ordinary cordless drill and turns it into a soil digging machine. Even digs straight through solid clay. Will work for Drills of all sizes, 18V or greater drill recommended. Save Time and Effort, Plant hundreds or just a few bulbs in minutes. Applications: A professional landscapers' choice for dramatically increasing efficiency when planting bulbs,potted plants, vegetables, flowers, bare root trees and shrubs, tilling soil or planter boxes, mixing seed, soil, fertilizer, paint, or batches of mortar mix for hardscapes; Effortlessly dig post holes or even bring it on vacation to drill a hole in sand to anchor your beach umbrella. 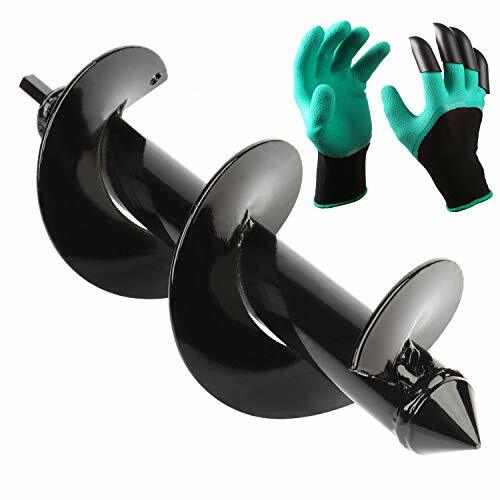 Package List: 1 Pc Auger Drill Bit + 1 Pair of Gloves (free), 30 DAYS SATISFACTION GUARANTEE. 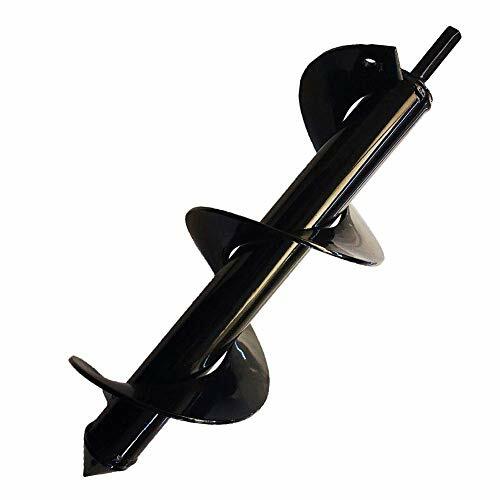 Planting and landscaping can be a guessing game and back-breaking hard work, but the Scorpiuse Garden Auger makes the process simple. 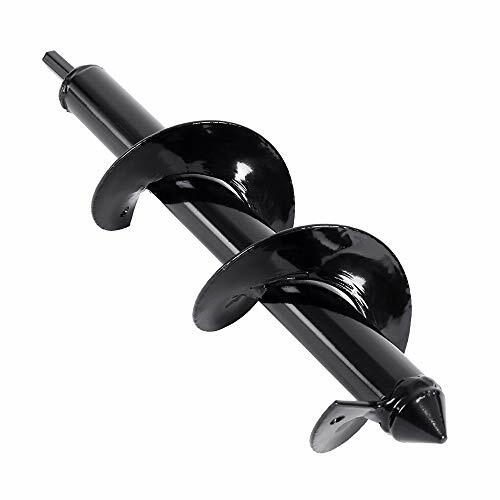 It eliminates constantly bending over while drilling, and this rapid planter will even drill through loose, rocky material so you can plant bulbs and bedding plants anywhere you want. Use a 3/8-inch 18V or greater drill on a slow speed to drill into your landscape and lift the rapid planter out of the created hole. 3-inch (7.6cm) potted plants, vegetables, flowers, bare root trees and shrubs, tilling soil or planter boxes, mixing seed, soil, fertilizer, paint, or batches of mortar mix for hardscapes; Effortless dig post holes or Ice holes. Size: 63/64 inch (2.5cm) steel shaft with non-slip hex drive (0.8cm); This shaft is more bigger and powerful than 5/8" and 3/8". 3-inch (8cm) diameter x 12-inch (30cm) length. Various Applications-A professional landscapers' choice for dramatically increasing efficiency when planting bulbs,potted plants, vegetables, flowers, bare root trees and shrubs, tilling soil or planter boxes, mixing seed, soil, fertilizer, paint, or batches of mortar mix for hardscapes; Effortlessly dig post holes or even bring it on vacation to drill a hole in sand to anchor your beach umbrella. 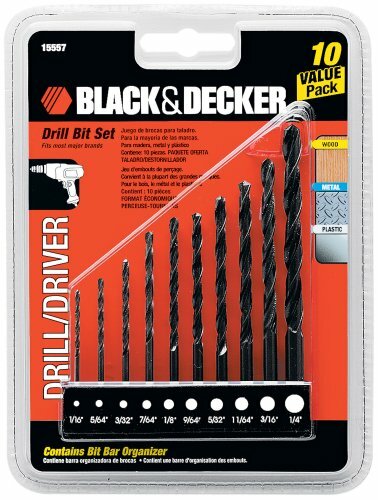 Easy to use:Will work with any 3/8 or larger chucked drill, 18V or greater drill recommended. Plant hundreds or just a few bulbs in minutes. 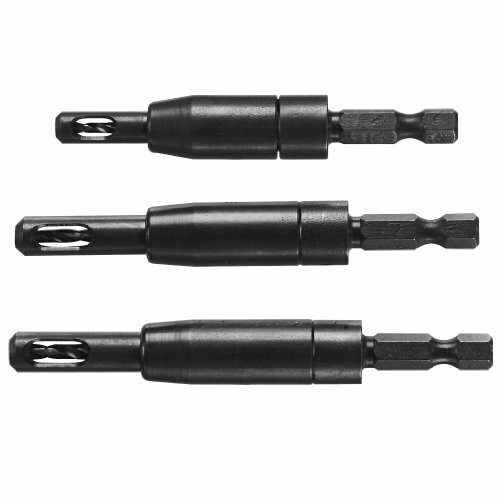 These deburring external chamfer tool can be used for repairing damaged bolt and tightening the nuts in place. The universal size and the simple design make it easily to carry and hold in your tool pouch. Handy enough to use and start repairing. 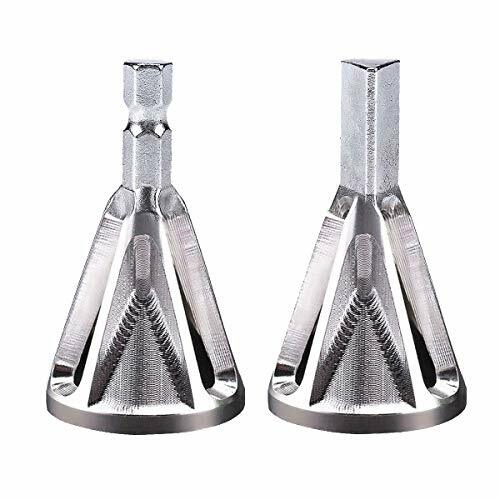 The material of these tool is high quality stainless steel, durable and hardness. Suitable for Stainless Steel, Hardened Steel, Mild Steel, Copper, Brass, Aluminum, Fiberglass, Wood, Plastic. 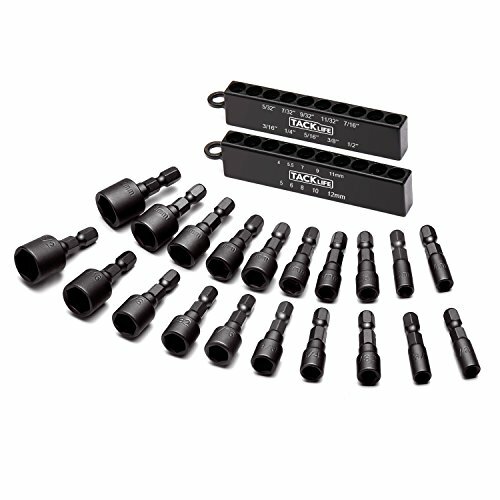 Can be used for 8-32 bolts (.164) up to 3/4 -10 (.750) - (4mm -19mm). Threads and non threads stock are all available. Using the lowest speed on the drill bit and then applying pressure slithtly to remove the burr. Safe and efficient. 3" (7.6cm) diameter x 12" (30.5cm) length. Blika Premium gloves are made of natural latex rubber which provides medium protection against accidental cuts, scratches and pricks from thorns, sticks and claws prevent broken nails. You skin will not contact dirt directly. Easily cleaned amd stored. Simply wash your gloves under running water for cleaning. Make you gardening easy and fun. Protect your skin and manicure. Applications: 3-inch (7.6cm) potted plants, vegetables, flowers, bare root trees and shrubs, tilling soil or planter boxes, mixing seed, soil, fertilizer, paint, or batches of mortar mix for hardscapes; Effortless dig post holes or Ice holes. 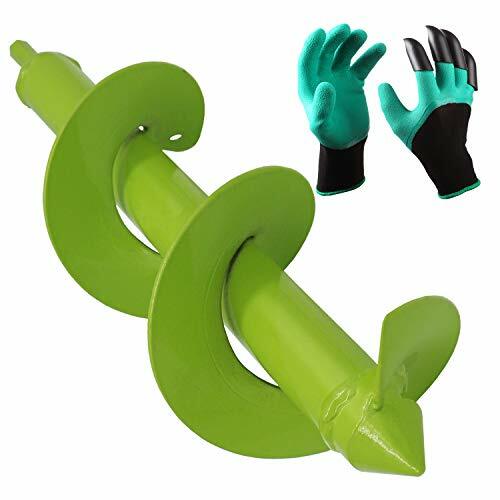 Material: Made of heavy duty steel, with glossy green painted finish. Proven to be the most durable in the industry. Size: 63/64 inch (2.5cm) steel shaft with non-slip hex drive (0.8cm); This shaft is more bigger and powerful than 5/8 and 3/8. 3-inch (7.6cm) diameter x 12-inch (30.5cm) length. 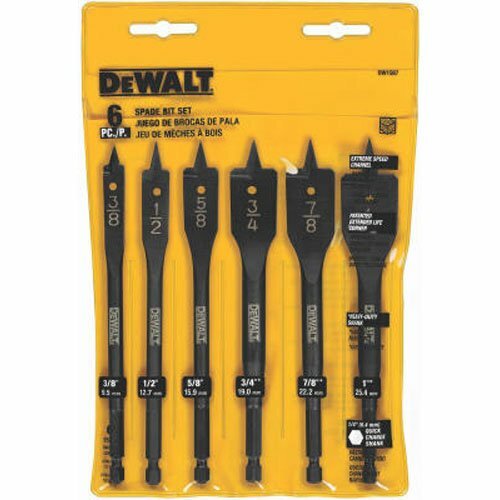 Easy to use: Will work with any 3/8 or larger chucked drill, 18V or greater drill recommended. Plant hundreds or just a few bulbs in minutes. 3" (7.6cm) diameter x 10" (25cm) length. Material: Made of heavy duty steel, with glossy black painted finish. Size: 63/64 inch (2.5cm) steel shaft with non-slip hex drive (0.8cm); This shaft is more bigger and powerful than 5/8 and 3/8. 3-inch (7.6cm) diameter x 10-inch (25cm) length. --Please feel free to contact us by emails for solution if there are any problems. 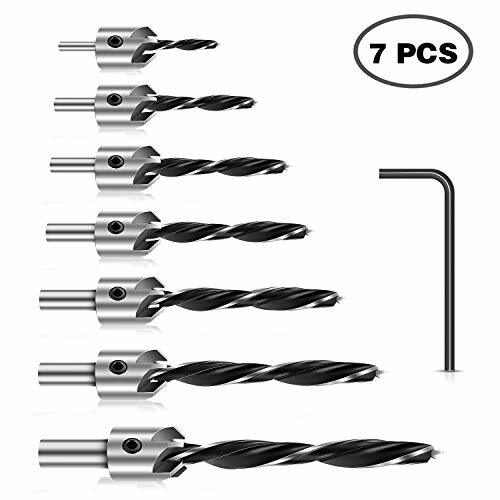 Removable & Adjustable : Drilling length of the countersink drill bits set can be adjusted for various length screws simply by loosening and tightening the screw. 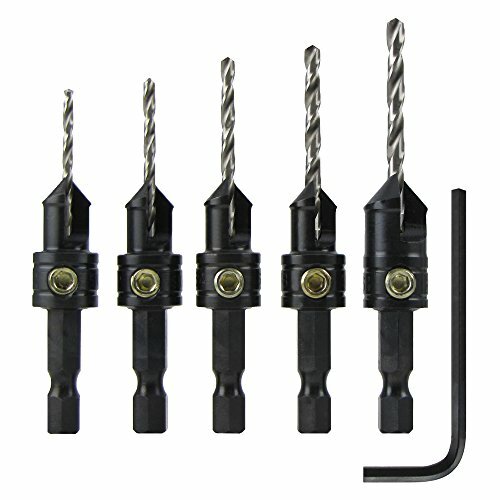 Advantage : Woodworking Drill Bits Set has large chip flute and five-edge chamfer machine, the operation of faster discharge of sawdust, you will get a nice smooth surface on any type of hard, soft wood or aluminum. Wide Applications : Perfect for drilling machines with chuck, for drilling on hard wood or wooden floor. 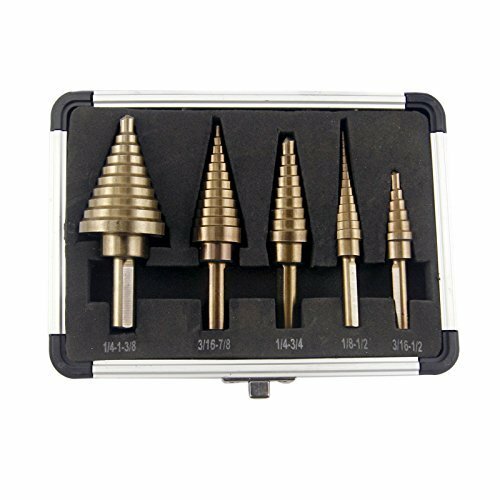 The countersink drill bits set are applicable to bench drill, hand drill etc. Use on wood. Drilling length can be adjusted for various length screws simply by loosening and tightening the setscrew.